What’s Your Megaphone Used For? You all know what a megaphone is, right? It’s a cone-shaped object that people use to amplify their voice when needing additional attention for their cause. The most common use of a megaphone is probably at a sporting event. 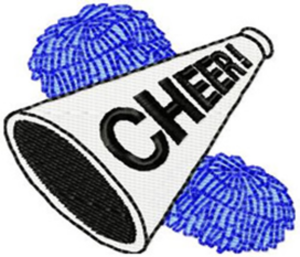 We see cheerleaders use them to fire up the crowd with the latest cheer to rally around their team. Today I ask you: what’s your megaphone used for? *Do you have a friend or family member serving in the military? *Do you have a loved one suffering from Alzheimer’s disease? *Have you lost someone close to you to cancer? *Does your heart ache to work with children and help them know how important they are? *Do you want to bring awareness to the environment and teach others how easy it is to recycle? I bet if you think long and hard, there are things that tug at your heart that you rally around and want to promote to others as you get on your soap box and hold your megaphone. I have several things that cause me to grab my own megaphone – children who suffer from life-threatening illnesses, women who have goals and dreams but aren’t sure how to make them happen, and finding ways to make a difference to someone every single day. And in the midst of all of our soap box intentions, the desires of our heart and megaphone holding we find God waiting. He is waiting to be the center of our rally. He wants to help us with the desires of our heart. David tells us in Psalm 37:4 to delight ourselves in the Lord and he will give us the desires of our heart. Whatever is the deep aching desire of your heart, ask God to open the right paths for you to get out your megaphone and serve the cause. And in all that you do, do it for Him and he will make the way straight. Grab the megaphone. Stand on the platform. Shout it out loud – Hip, Hip Hooray. God is the only way! This entry was posted on August 8, 2017 with tags: make a difference everyday by Deanna Young.